Either they’re putting something in the water, or I really have been seeing psychedelic pianos everywhere. I’ve tried only looking at them out of the corner of my eye, but they persist in failing to disappear. I assume it’s something to do with the Chopin anniversary. I had a vision of the planning meeting: “Chopin wrote piano music, right? So, let’s put pianos everywhere.” It might influence people to find a piano teacher. Sheer genius. 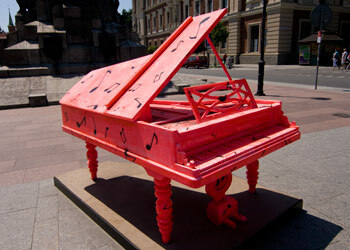 Nothing says “Chopin” to me like a bright pink piano. Presumably on the next big Mickiewicz anniversary the streets of Krakow will be littered with giant plywood pens because, you know, he wrote stuff. Usually it takes more than the inexplicable appearance of trippy pianos to make me question my sanity, and the city has not failed to provide them. There is what I can only describe as a “thing” on St. Mary Magdalene Square. No matter how hard I look at it I can’t decide if it’s a kids’ climbing frame or a devastatingly insightful comment on kids’ climbing frames. The already alarming statue of the arch Jesuit Piotr Skarga glowers down at the “thing” from his perch and looks ready to pounce on the toddlers who have concluded that it is, in fact, a kids’ climbing frame. At the bottom of Wawel Hill is another “thing” of mysterious provenance. It’s bright yellow and looks like a cross between a bailing machine and a Vogon starship. It might well be a bailing machine, or some other essential piece of urban management kit, but the preponderance of other wittily-coloured installations around the town has forced me to reject mundane interpretations and Chercher l’Art. I spent 20 minutes studying a giant display case containing everyday household objects and a bearded man the other day, until I realised it was a kiosk. The child-trap thing, the pianos and the Vogon starship are temporary structures, but there is evidence that the authorities are now building neon absurdity directly into the fabric of the city. I speak, of course, of the new Plac Szczepański. At any hour of the day tourists and residents are to be found clustered around watching street bums bathing in the pastel-lit fountain spouts as the Minute Waltz plays in the background. It’s a kind of hobo nightclub. I walked past there last night and saw a gang of screaming children leaping gazelle-like over the excitingly random rods of water as Wagner’s Ride of the Valkyries blared from concealed speakers. When I was a kid we had to rely on lawn sprinklers for thrills like that. A golden opportunity to take advantage of this surrealist trend was missed last month when the new pedestrian bridge was floated across the river. The fact that they decided to float the thing into position on a cluster of lashed together barges was, in itself, an act of stunning theatre. If only they had thought to paint it DayGlo orange and play Nocturne No. 9 they could have called it “The Bridge Experience” and sold tickets.